Nicole Larson was the kind of person whose smile always made you want to smile back. It was only after a while that it struck you: She always smiled with her mouth closed. It had been six years since Nicole last sat in a dentist’s chair, seven since her last full exam or X-rays. Childhood dental visits had been rare: Her parents’ low-wage jobs never had insurance, and after paying for rent and heat and food, there was rarely much left. As an adult, she worked long hours as a waitress and hotel housekeeper, but those jobs lacked insurance, too, and the meager pay always ran out before the month did. So Nicole learned to white-knuckle it through toothaches, popping handfuls of ibuprofen. She brushed constantly, rinsing with every oral rinse the drugstore sold. And she perfected a dimpled, twinkle-in-the-eye smile that always got a smile in return … but didn’t require her to open her mouth. But today all that was about to change. She had landed a new job — still minimum wage, but this time with dental coverage. She sat in the waiting room, praying that today would be the day the pain finally stopped for good. The dentist called Nicole into the exam room, poked and prodded a bit, and listed some treatment options. Nicole crossed her fingers. And the door clicked shut behind him. It was nearly a year before Nicole even tried another dentist, too afraid of more humiliation, of being treated as if her condition was the result of some moral failing, instead of the logical outcome of a lifetime of low wages and no insurance. But she couldn’t help wondering: What had made an otherwise nice, competent, community-minded, churchgoing professional suddenly morph into such a jerk? Americans, by and large, are a charitable bunch. Need canned corn for the food drive? Pairs of gloves for the church “mitten tree”? Dolls and bears for Toys for Tots? We’re all over it … and we’ll probably give you three. But our compassionate instincts have some blind spots, no matter whether we vote red or blue. It’s not because we’re heartless (well, usually, anyway). It’s rather because we so often don’t understand the back story to what we’re seeing, or the unseen factors in play. The rude dentist wasn’t a cartoon villain; heck, most of the time he was probably a pretty nice guy. The problem was that he was utterly unable to imagine a life unlike his own, in which dental care wasn’t a given — where if there are five things on the list of essentials and the money runs out after item four, you just can’t have number five, no matter how bad the pain. There was nothing in his personal experience to suggest the existence of such a life. He’d never imagined it, and no one had ever made him try. So he felt nothing when he crushed Nicole’s hope and pride in two short sentences; indeed, he didn’t realize he was doing it at all. Maybe she wipes your child’s face at day care. Maybe he mops the floors at your church. Maybe she makes the beds in the hotel you stay at. Maybe he trims your shrubbery and mows your lawn. Maybe she lifts your elderly aunt in and out of her wheelchair each day at the nursing home. Most middle-income Americans have no idea how many of the people around them every day are living in poverty. We think of “the poor” as only elsewhere, in inner cities or far-off trailer parks, anywhere but here. We tell ourselves that the poor are simply slackers who don’t want to work … or that the only folks earning wages you can’t live on are teenagers working summers at McDonald’s, who will of course go to college in the fall. But it’s not true. Fifty-seven percent of the families below the poverty line in the U.S. are working families, working at jobs that just don’t pay enough. They’re not teenagers, they’re not lazy, and they’re not somewhere else. (After all, if every McDonald’s employee is a high school student, how can I buy a Big Mac at noon on a school day?) These folks are childcare workers, janitors, house cleaners, lawn-service workers, bus drivers, hospital aides, waitresses, nursing home employees, security guards, cafeteria workers and cashiers — and they’re the people who keep the rest of society humming along for everybody else. Ironically, it really was for someone else, a nursing home worker I’d been urging for weeks to sign up for the food program. (I ran a small housing nonprofit serving low-wage workers for nine years, and we’d met through that organization. It’s also where I met most of the other people quoted in this article.) When she declined, I offered to pick up the food for her. How bad could it be? So I was flabbergasted by my sudden, intense need to make sure that a total stranger — whom I would never see again, mind you — would not think I needed food from a food pantry. Which is why the line at the local food bank is but a small slice of all the struggling families in a given area, she added. Most are at home trying to make a box of noodles last two nights instead of one. Unfortunately, the emotional toll of poverty is not limited to the food bank. Low-wage families often get dirty looks for using food stamps in the checkout line (which is especially galling if — like many food stamp recipients — you’re employed and just need a small supplement to make ends meet). And they often work in jobs that don’t garner much respect in the first place. They’re treated as replaceable, invisible or both. Think about it. Right now, you could easily name your doctor, your kid’s teacher and a prominent local business owner. But, quick: Can you name the lady who cleans your office? The school janitor? Any nurse’s aide in your grandmother’s nursing home? Any waitress or cashier, anywhere? If you held one of the latter jobs, what would that mean for your sense of yourself, of how much you were worth? Sure, we all have days where we feel unappreciated at work. But most white-collar workers get at least the occasional nice performance review, bonus, or thanks. But nobody ever praises a cleaning lady for polishing the faucets extra well, as Barbara Ehrenreich illustrates memorably in her classic book “Nickel and Dimed.” Hotel housekeepers only hear from the boss if they’re suspected of stealing. Garbagemen have folks look right at them and not even see them at all. Day after day, it has an effect, no matter how much confidence you were born with, or how much bravado you project. I remember sitting in the home of a hotel housekeeper as her phone rang and rang. “Do you want to get that?” I asked. “No,” she said, “it’s my son’s teacher.” “You’ll just call back later?” “No,” she said again. At first I was flabbergasted (she’s trying to help your child!). But as we talked, I realized that, unlike a middle-income parent, she didn’t see the teacher as a peer, reaching out to discuss a matter of mutual interest. She saw the teacher as an authority figure — another higher-up telling her she was “less than,” another boss telling her she’d screwed up, this time as a parent. What looked for all the world like apathy and defensiveness turned out to be a profound lack of confidence and a tattered sense of self-worth. When researchers at Princeton University showed two groups of viewers the same video of a little girl answering questions about school subjects, they told the first group that her parents were affluent professionals. They told the second group that she was the daughter of a meat packer and a seamstress. The girl, named Hannah, performed right at grade level on the videotaped test, answering some questions correctly and missing others. But when asked about her performance, the first group, primed to believe she was wealthy, felt that she had performed above grade level. The second group, primed to believe she was not, felt that she had performed below. It was the same video, mind you — the same girl, answering the same questions in the exact same way. But their conclusions were totally different. Sometimes we see what we’re looking for … and what we’re looking for changes based on the context. Of course, sometimes maybe it is problems at home. But sometimes it’s not — and sometimes middle-class and affluent families have family problems, too. We have a similar double vision in other areas, too. We want compassion and therapy for our friend whose depression spiraled into prescription-drug abuse, but expect the low-wage worker caught out by the loading dock with a baggie of Vicodin to be fired … even though it’s the exact same thing. We call celebrities who drink and crash their cars “troubled,” but construction workers who do so “drunks.” Our society says middle-class seniors who transfer assets so they qualify for Medicaid nursing-home care are “just being practical” (there are whole legal practices built around helping them do it) … but the thought of a low-income family doing anything to qualify for additional government assistance for food or heat or medical care makes us collectively lose our minds. Somehow we are looking at the same situations, yet registering very different things. In the living room of my first apartment, there was a mustard-yellow beanbag chair, a hand-me-down lamp and an ancient fake-wood-sided TV that made a loud kachunk when you changed the channel. I didn’t earn much, and joked that my unimpressive car could do zero to 60 in 10 minutes flat. It could be tempting to say we “understand poverty” because of experiences like this, when we lived in small apartments or considered Ramen noodles a legitimate entree. But it is not necessarily the same at all. A lot depends on what — and more important, who — is around you. It is much easier not to panic about tight finances when Mom and Dad have a guest room you can always move back to (even if you never actually do). It helps if you have a medically trained friend you can call in a pinch, especially if you don’t have insurance. It helps when Aunt Ginny can give you her hand-me-down furniture, or Uncle Bob will sell you his old but reliable car. It helps when there’s someone in your family who can advise you about applying to college or buying a home. It’s reassuring to know that, no matter how bare your cupboard, there will be a full spread of food when you go home for the holidays, and family and friends who can help you, standing in the wings. All that stuff feels like background noise, right up until we stop and imagine what life would have been like without it. Sure, maybe we would have managed just fine regardless … but maybe we wouldn’t have (and it certainly would have been more stressful). It is one thing to be a brave, precarious little boat when you are surrounded by the Coast Guard. It is quite another when you are surrounded by boats sinking faster than you are, looking to you for help. The director of a New York nonprofit was sitting in a conference room, listening to her well-heeled board members talk about the organization’s low-income clients. They just need to tighten their belts! they kept saying. One can counter, of course, that you get to buy luxuries when you have the resources, which is true. But it does not necessarily follow that if money is tight, the only possible explanation must be your wild and irresponsible spending. It might just be that there’s not enough money to start with. I’ll never forget the first time I sat down with a nurse’s aide who was struggling financially, confident that with some commonsense “belt-tightening,” I could get her budget back on track. Just few minutes in, I started to sweat. She already shopped at Aldi and the Salvation Army. She had a pay-as-you-go cellphone, just for emergencies. She set her thermostat at 63 degrees. There was nothing to trim. And when I added up her expenses and subtracted them from income, the resulting figure was $3. $3. The entire financial cushion of a woman working full-time at a societally useful job in the richest country in the world was less than the cost of a gallon of milk. There’s no give in the finances of a low-wage family: no margin for error, no wiggle room to account for the inevitable vagaries of life. Each day is spent tiptoeing along the edge of a canyon, knowing that the slightest breeze could push you right in. Things that seem fairly minor to middle-income families — an unexpected car repair, a high heating bill during a cold snap, a trip to the E.R. when little Connor breaks his arm — are cause for total panic, because there’s no cushion to absorb them. Pay for that car repair and now there’s not enough for the light bill; forgo the light bill and now there’s a late fee; pay for all that and now there’s not enough for the rent. It takes almost nothing to start a real avalanche. My head started to hurt. People sometimes say folks are poor because they make “bad decisions,” but she wasn’t doing anything wrong (and society needs nurse’s aides, after all, so it seems reasonable to hope you could be one without worrying about starving). But she had no cushion. There could be no surprises. She could not make mistakes. And she had to lead her life on the edge of a cliff — holding her breath, trying not to panic, calculating tradeoffs about even the smallest expenditure — every single day. I had never realized that simply being poor, even on a good day, was so utterly exhausting. In the years I spent working with low-wage families, I realized that they were not struggling because they ate at McDonald’s or had cable … but sometimes they ate at McDonald’s or had cable because they were struggling. This is an important distinction. If you are a single parent working for low wages, you do not shop for fun. You do not go to the gym, go to the movies, remodel the kitchen, take a road trip, visit amusement parks, build a deck, go skiing, join a swim club, or sign the kids up for dance class. Why? Because all of those things cost money, require items that cost money, or require a car reliable enough to go long distances. Your fun is limited to things that are nearby, cheap or free, that you can do after work when it’s dark and you’re exhausted, while supervising your kids at the same time. Other than reading, that sounds a lot like TV. And while of course it’s cheaper and healthier to eat every meal at home, what if you’ve just worked 12 hours scrubbing hotel bathrooms, and the nearest grocery store is a bus ride away? Or what if it’s little Bobby’s birthday, and a Happy Meal is the only treat you can afford? “What I had not understood until I found myself in true poverty is that it means living in a world of ‘no,’” writes Alex Andreou in the Guardian. “Ninety-percent of what you need is answered no. Ninety-nine percent of what your kids ask for is answered no. Cinema? No. Night out? No. New shoes? No. Birthday? No. Obviously none of this is cause to eat fast food every night or buy the fanciest cable package on the market — and conversations about these expenses are worth having, respectfully, with struggling families. But sometimes choices that seem foolish from the outside make a lot more sense from within. There are many prescriptions for combating poverty, but we can’t even get started unless we first examine our assumptions, and take the time to envision what the world feels like for families living in poverty every day. “Compassion is a skill that we get better at with practice,” writes theologian Karen Armstrong. It just takes a little imagination. 1) Determine the real need. Is the need we’re addressing a chronic need or a crisis? If it’s a crisis, by all means give whatever relief is needed (e.g. food, medical care, shelter). Once a crisis is averted, however, individuals and communities need help returning to their pre-crisis conditions (i.e. rehabilitation; e.g. job training, alcohol and drug treatment, counseling) versus more relief. If it’s a chronic need we’re addressing, determine which is appropriate: rehabilitation or development (i.e. improving a community for the long-haul; e.g. education, medical care, government infrastructure, job creation, etc.). If there’s hunger but no fear of starvation, a food co-op where members pay into a food-buying collective might be a good option. These co-ops affirm the dignity of the members and allow the group to buy ten times more food as a collective entity (here’s a great video that explains the model: http://www.urbanrecipe.org/our-model). If jobs are needed to afford food, food distribution coupled with a job readiness or placement program might address that need more directly. However, if someone is facing a one-time crisis (e.g. a sudden loss of job, injury, illness), free relief could still be the best option at that time. Respect is essential in determining the real need. Listen to those you’re trying to help – not as an external savior, but as a co-collaborator. Acknowledge their struggles, affirm their worth, and discover what ideas they have and what they have to offer. Then join in alongside them! Personal interaction is obviously a good way to develop compassion and understanding, but books can be great as well! Poor Economics gives an insightful and well-researched perspective on the complex economic environments of the poor, both domestically and internationally – here’s a quick summary. This article also gives similar insights on a more personal level. What use is it to know how to fish if you only have access to a polluted lake? Or no lake? Or if someone else controls access to the lake? Development can’t be done in isolation. Just as you can’t create a business strategy in a vacuum, you can’t create a development strategy without taking external factors into consideration. What could affect our work here? Will corrupt officials impede aid delivery or free markets? What crops are the weather/climate/soil suitable for? What’s the market – who would be interested in buying? Are there cultural barriers to entry? Are community members resistant to “outsiders”? What are their current sources of income? Do community members work together or stay isolated? For more on corruption and poverty, check out Economic Gangsters – interesting read! For more on the interplay of human interaction/game theory and poverty, check out Games in Economic Development (by one of my professors!). You might have a passion for food, but you wouldn’t start a restaurant if you can’t cook. Instead, you could review restaurants, interview chefs, or start a food blog of your favorite dishes. If you still want to start a restaurant, you’ll probably want to find a chef and then get advice from other restaurateurs! Similarly, you might have a passion for education, but why start a tutoring program if you have no experience in education? Instead, maybe consider pursuing another approach that will use your gifts while still helping the community. If you’re still passionate about education, actively recruit experienced staff, volunteers, or board members and allow them to help guide strategy development! Also see what resources the community has. What individual skills or material resources could help others in the neighborhood? What makes residents proud of their community? Will these programs effect long-term change? Are they good in the short-term but bad in the long-term? Are students just memorizing testing strategies or really learning? Just as business investors check in periodically to see how their investments are doing, nonprofit programs need to be evaluated regularly to see if they’re still achieving their intended results. It’s not enough to invest in a good cause – we must invest wisely. We can’t get lazy because it’s a good cause – if anything, we must be more rigorous in our evaluations. Someone’s life could depend on it! As we’ve seen, effective community development requires research, evaluation, and continual flexibility and adjustment. The best strategy is often not the easiest strategy! Successful community development collaboration is complicated. Not only do nonprofits need to plan, communicate, implement, and evaluate excellently to succeed (much like for-profit businesses do! ), but staff members, community residents, donors, and volunteers all bring different cultures, values, expectations, and agendas to a (hopefully) shared vision. Coordinating all of this requires discipline, dedication, teamwork, and wisdom. Given all of this complexity, please please don’t check your brains at the door! Share more ideas in the Comments section below! * If an organization you’re interested in doesn’t seem to be following these tips, don’t write them off right away. Have a discussion (or two or three…) with the leaders about their mission and strategies. Maybe there’s something going on behind the scenes you’re not aware of. Or maybe you can help point them in the right direction. Toxic Charity and When Helping Hurts would be great reads! 1) Don’t get me wrong – I have an amazing life: wonderful friends and family, a beautiful house, access to food, plenty of clothes.. BUT I also have no incentive to work: I have ALL of this without needing to lift a finger. 2) I’m also embarrassed that I don’t work. When asked what I do, I often avoid eye contact and mumble, “uh.. nothing”. I’m grateful that people care and want to help, but it’s embarrassing that I can’t land any of the jobs I’m applying for. So how does this relate to charity, you ask? Chapter 2: Juan Ulloa, Opportunity International’s Nicaragua Director, laments that American church partners “’destroy the initiative of [his] people’” and turn them into beggars: why work when donors continually provide free clothing, books, and manual labor? I know my situation is a little different (and poverty is so much more complicated than these 3 simple points), but charity – even when done with the best of intentions and out of love – can destroy incentive, emasculate, and hurt the helper/helpee relationship. Hopefully these examples will help spark ideas for more effective development strategies (e.g. rethinking aid incentive structures, training and empowering, ensuring recipient accountability). Please leave any other ideas in the Comments section below! A lot of these ideas are from Toxic Charity by Robert Lupton and are very similar to those in When Helping Hurts (a book I’ve posted on before: here and here). More to come in future posts! 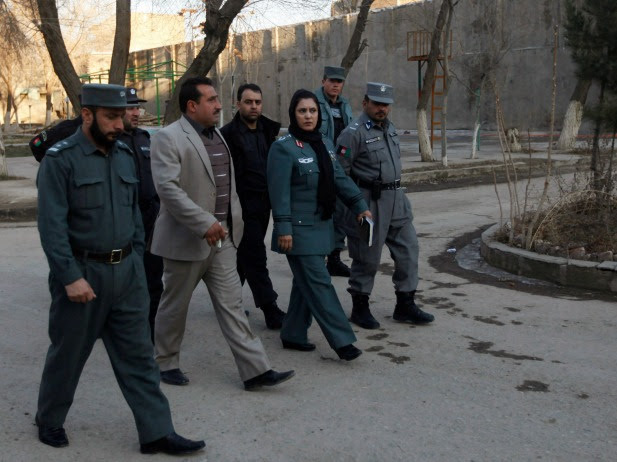 Colonel Jamila Bayaaz, the first female district police chief in Afghanistan, walks in Kabul, January 15, 2014 (Courtesy Reuters/Mohammad Ismail). As discussions about post-2014 U.S. presence in Afghanistan continue, so do concerns about the country’s ability to stand on its own. The Afghan people and their government will determine the direction of the country. And as that future is discussed, so is the question of what will happen to 50 percent of country’s population: women. When the Taliban came to power in 1996, they forbade women from attending school, working in offices, and leaving their homes without a male chaperone. Much has changed in the past decade as many women have worked to make the most of openings created by the international community’s presence. Twelve years ago, there were fewer than 900,000 boys and almost no girls in school. Now there are more than 8.3 million students in school across Afghanistan, and 40 percent of them are girls. As noted in the recent report on Women’s Economic Empowerment in Afghanistan, published by the Afghanistan Research and Evaluation Unit, there are currently sixty-nine women in Afghanistan’s Parliament, and the country aims to have female representation in parliament reach 30 percent by 2020. There are also twelve women in executive government departments, as well as five deputy ministers, one governor, one mayor, and numerous other women serving across the government. Women have even increased their presence in the police force, with an estimated 1,551 women donning police uniforms as of July 2013, according to Oxfam. The country recently saw the first woman appointed as district police chief. Maternal health has also improved. The 2010 Afghanistan Mortality Survey estimated that there are 327 maternal deaths for every 100,000 live births, a drop from the 1,600 per 100,000 estimated in 2008. This progress is thanks to an increase in average age of marriage, higher contraceptive use, lower fertility, and greater access to maternal care, as noted in the 2011 CFR working paper on Maternal Health in Afghanistan. Despite daunting challenges, women have achieved economic gains as well. A recent report funded by the U.S. embassy in Afghanistan found that more women than ever work in formal businesses in Afghanistan as employees, owners, and entrepreneurs. The report, which surveyed more than 1,400 Afghan businesswomen across thirty-four provinces, also found that “views on women at work appear to be steadily evolving, with more segments of the population becoming amenable to and supportive of women’s economic participation.” Nearly all women surveyed said they had their family’s backing. Family support, paired with changing attitudes—such as considering education and employment valuable attributes in a wife—are helping create more opportunities for women in the workplace. Seventy-eight percent of the women surveyed work in small businesses, and 81 percent cited access to financial services as a barrier hampering their economic potential, paralleling trends worldwide when it comes to women’s economic participation. Most respondents also said that they could use more business education, financial management skills, technical support, mentor-mentee opportunities, and support from the Afghan government in accessing these services. Afghan women face the barriers to economic empowerment women struggle with worldwide, in addition to government corruption, deep-rooted cultural norms, and weak institutions and infrastructure that further limit their opportunities. The most fundamental threat to women remains safety and security, especially as the Law on Elimination of Violence again Women in Afghanistan has been implemented inconsistently. Taken as a whole, these challenges make Afghanistan one of the most challenging environments for businesswomen to survive, much less thrive, in. But Afghan women have proven their resilience time and time again. If education rates for girls and women and community perceptions of the value of women continue to improve, women’s presence in the economy will grow. These changes will allow Afghan women to contribute even more to their families and communities, and pave the way for greater prosperity for all. Sustainability. We hear and use that word frequently in international development, and most of the time the word is abused. But what does it really mean? As a Nigerian leading the Partnership for Transforming Health Systems 2, a six-year project funded by the the U.K. Department for International Development to strengthen Nigeria’s health system, I can tell you based on decades of development program implementation in Sub-Saharan Africa — and Nigeria in particular — what it means to me. I have lived it. Grant recipients in developing countries must first understand the rationale behind the grant, the benefits to them and their role in its implementation before they will embrace it. Unless the people of a nation truly buy into the project and are passionate about its goals, it will not last. Until they own it, they cannot sustain it. Ownership precedes sustainability. At the inception of the PATHS 2 program in 2008, Nigeria had about 2 percent of the world’s population, but contributed 10 percent of the world’s maternal deaths. To reverse this trend, the project has been supporting the government of Nigeria at the national, state and local government level, working in five states of Kano, Kaduna, Jigawa, Enugu and Lagos to improve the health of women and children, especially in rural areas. Jigawa, Kaduna and Kano are three states in Northwest Nigeria with high rates of maternal mortality — as high as 1,100 deaths per 100,000 live births. One of the major contributors to maternal deaths is poor access to facilities. Traveling to a health facility can involve long distances, bad roads and high costs, contributing to women dying in childbirth before ever reaching help. To improve access to facilities, save women’s lives and make the community part of the solution, we’ve established an initiative in collaboration with the State Ministry of Women’s Affairs and Social Development called the Emergency Transport Scheme. We partnered with Nigeria’s powerful and well-organized transport union to turn taxi drivers into volunteer ambulance drivers who use their own cars to get pregnant women to the hospital or clinic during obstetric emergencies. Under this program, the union drivers get training on safe driving and understanding the danger signs in pregnancy. Drivers who volunteer for this program get special privileges in their day jobs, such as being promoted to the front of taxi ranks. Since the program began in 2012, the ETS has helped more than 2,274 women receive timely medical help. In addition, PATHS 2 has facilitated an Emergency Maternal Fund in more than 50 communities in Kaduna. This draws upon donations from community members. Very poor members of the community can borrow from it and repay later without interest to help cover the costs of caring for maternal and child health emergencies. Without programs like these that enable communities to see their roles clearly, get involved and become active participants, sustainability is a mere illusion. In Nigeria, we’ve found that getting people involved at the grassroots level — and really listening and responding to their concerns, their fears and their hopes — can have a positive impact on the lives of people who need help the most. One of PATHS 2’s key efforts has been refurbishing health facilities in an effort to get expectant mothers to use them. Many pregnant women were giving birth at home using traditional birth attendants, which increased risk of death or injury both to themselves and their baby. So it was important to understand why women were using this riskier option, instead of making our own assumptions. What we found is that many of these facilities had fallen into disrepair, people did not feel welcomed by health care providers, and staff morale was low. Thanks to the creation of Facility Health Committees, made up of local citizens, the health centers are more accountable — and have stronger links — to the communities they serve. Today, the health centers are clean and modern. Patients say they feel welcomed. Staff, who are better trained, are able to provide around-the-clock care in emergencies. At the same time, we recognized the need to accommodate local customs, so traditional birth attendants are being trained to identify when a pregnant woman is in danger and refer them to a facility. These activities help ensure that people have a voice in the outcome, making it more likely they will carry on with the work long after we are gone. Like many countries, Nigeria faced a serious problem when it came to getting trained doctors to serve in rural areas. As of 2012, there were about 18 skilled professionals (doctors, nurses, midwives) per 10,000 people, compared to the World Health Organization’s recommended ratio of almost 23 skilled health workers for every 10,000 people. Very often, rural health facilities cannot attract doctors because of their remote locations, and because the local government authorities cannot pay for their services. So we turned to Nigeria’s National Youth Service Corps, which runs a compulsory year-long program of national service for young people after graduation from a university or polytechnic school. We signed an agreement to send health professionals to our project sites. Some of those medical graduates who are doctors, nurses and pharmacists are now selectively posted to provide basic emergency obstetric care in rural health facilities that are supported by the PATHS 2 project. This means that the lives of mothers and children are being saved and more patients are seeking care at rural health facilities. Involving the youth in solving a nation’s toughest challenges is a critical component of making a project sustainable. We know that good health is essential if our families and our nation are to thrive, develop and prosper. But I also know from working on development projects throughout my career that the best intentions can fall short if we don’t involve the community and listen to their concerns and input. They must be part of the solution. Until you own it, you cannot sustain it. Abdulkadir leads a group of health volunteers in Nigeria, where the U.K. Department for International Development uses an innovative community-based approach to help women safely deliver their babies. Involving people at the grassroots level helps ensure that a project becomes sustainable. Mike Egboh is national program manager for the Abt Associates-led Partnership for Transforming Health Systems 2 in Nigeria. A Harvard MBA graduate, Egboh has over 30 years of experience supporting the health system in his native Nigeria. Emerging Voices features contributions from scholars and practitioners highlighting new research, thinking, and approaches to development challenges. This article is by Lynn ElHarake, research associate for CFR’s Women and Foreign Policy Program. Here she discusses how motherhood in childhood undermines economic growth, health, gender equality, and development. Ninety-five percent of all births to adolescent girls occur in the developing world. Every day, 20,000 girls under the age of eighteen in the developing world give birth; girls living in developing countries have about a one in five chance of becoming a mother before adulthood. Two million of adolescent births worldwide will be among girls below the age of fifteen. These young girls are more than twice as likely to die in childbirth and have a much higher risk of obstetric fistula than if they had waited until they reached twenty to give birth. Early childbirth not only greatly endangers the life of the mother, but also her child. According to the World Health Organization, the chance of stillbirths and death in the first week of life are 50 percent greater for a baby born to a mother below the age of twenty than those born to mothers between the ages of twenty and twenty-nine. The adolescent girl’s newborn is at increased risk for low-birth weight and sexually transmitted infections, including HIV. Although the health consequences of early and unplanned births for adolescent girls are undeniable, the social and economic ramifications of motherhood in childhood are perhaps obvious. The Motherhood in Childhood report found that the lifetime opportunity costs related to adolescent pregnancy in Africa were the highest in the world, amounting to billions of dollars: as a result, Uganda lost 30 percent of its GDP, Malawi lost 27 percent, and Ethiopia lost 15 percent. The consequences of motherhood in childhood extend beyond the developing world. According to the Center for Disease Control and Prevention, children of teen moms in the United States perform worse in school and have more health issues than other children. They are also more likely to experience unemployment and incarceration as adolescents, and go on to become teen parents themselves. And just like in the developing world, when girls in developed countries become mothers, much of their economic potential is lost. For example, adolescent pregnancy and childbirth in the United States cost taxpayers around $10 billion every year – and billions more if you count the lost potential of teen moms who are unable to finish school, enter the workforce, and contribute to the economy. In its 2013 Education at a Glance report, the OECD attributed economic growth in member countries to higher educational attainment over the past fifty years, especially among girls. But in the United States, only 50 percent of pregnant adolescent girls, most of whom go on to become single moms, finish high school by age twenty-two. So what can countries do to prevent adolescent pregnancy and ensure that young girls have the opportunity to achieve their full potential? As the UNFPA report mentions, governments and international actors have already made progress reducing adolescent pregnancies through programs that promote girls’ education, create economic opportunities for women, and reduce HIV/AIDS rates. But the report also calls for a “shift away from interventions targeted at girls,” and instead toward more “broad-based approaches” that aim to build girls’ human capital and empower them to make their own decisions, especially regarding family planning. These topics were discussed at last week’s International Conference on Family Planning in Addis Ababa, Ethiopia. A revised strategy for ending motherhood in childhood must “target the circumstances, conditions, norms, values, and structural forces” that drive adolescent pregnancies, while also providing services to girls who are often isolated and marginalized during and after pregnancy. To prevent adolescent pregnancy, issues such as gender disparity, child marriage, and poverty must be addressed. Community programs can tackle some of these issues by promoting girls’ education, family planning, and employment opportunities. Governments should also expand social and economic opportunities for women, and international organizations should keep combatting adolescent pregnancy at the top of the development agenda. Daunting as the issue may be, the humanitarian and economic costs of adolescent pregnancy are too great to ignore, and everyone stands to benefit from making motherhood in childhood an issue of the past. Last month, academics, advocates, and religious leaders gathered at an event organized by the Council on Foreign Relations during the American Academy of Religion conference to discuss the relationship between religion and child marriage. Although global rates of child marriage are on a downward trajectory, progress in curbing this practice has been far too slow. The United Nations estimates that one in three women aged twenty to twenty-four —almost 70 million women total — married under the age of eighteen. Approximately 23 million were married under the age of fifteen, and some were married as young as eight or nine years old. The implications are dire: child marriage is linked to poor health, curtailed education, violence, and lawlessness, all of which threatens international development, prosperity, and stability. Religion is often blamed for the prevalence of child marriage. Notably, however, the practice is not unique to any one faith; in fact, it occurs across religions and regions. For example, in India, where 40 percent of the world’s known child brides reside, child marriage is prevalent among both Muslims and Hindus. In Burkina Faso and Ethiopia, child marriage is practiced by Christians and Muslims alike. An analysis by the International Center for Research on Women found that what is constant across countries with high child marriage rates is not adherence to one particular faith, but rather factors such as poverty and limited education opportunities for girls. The prevalence of child marriage varies greatly even among countries that incorporate religious doctrine into their legal systems. Some Muslim-majority countries, for example, that integrate Sharia law, such as Libya and Algeria, have relatively low rates of child marriage. In other countries that practice Sharia law, such as Yemen, the practice is rampant. Child marriage might not be tied to one faith, but religious leaders still have a crucial role to play in curbing the practice — particularly because marriages are often ratified as part of a religious ceremony. Working with religious leaders to tackle the scourge of child marriage has proven especially effective, both because these leaders are uniquely influential in their communities and because religious texts and traditions often encourage advocacy on behalf of the most vulnerable, including children. Examples of successful programs to combat child marriage by engaging religious leaders abound. In Ethiopia, for example, Pathfinder International partnered with local faith leaders and government officials to increase awareness about the risks and consequences of early marriage. As part of this program, Orthodox, Catholic, Protestant, and Muslim religious leaders committed to ending child marriage and other harmful traditional practices. In 2005 and 2006, Pathfinder estimated that this initiative prevented more than 14,000 early marriages in the Amhara and Tigray regions of Ethiopia. Tostan, a faith-based NGO in Senegal, is another organization that has worked effectively with religious officials to prevent child marriage. Tostan partners with community and faith leaders in community empowerment programs to address traditions that are harmful to children, including female genital mutilation and child marriage. Through engagement with these leaders, over 6,400 communities in Senegal have pledged to end child marriage and other harmful practices. As these programs demonstrate, religious leaders can be valuable allies in combating child marriage. Development organizations should engage with these leaders to eliminate child marriage across countries, regions, and faiths.